Slooh astronomers say this image of the moon gives a glimpse of what's in store for their Chinese New Year broadcast. Whether or not you believe babies born in the Year of the Goat will have a lifetime of bad luck and unhappiness, tomorrow is a day of celestial significance. To mark the beginning of the Chinese New Year, the online Slooh Community Observatory will broadcast real-time views of the new moon on Thursday (Feb. 19). Slooh's webcast will begin at 8:00 p.m. EST (01:00 UTC Friday, Feb. 20). You can watch the lunar broadcast live directly through Slooh.com or check out the moon webcast on Space.com. The Chinese zodiac's 12-year cycle — with each year represented by a different animal with its own virtues and flaws — is based on the lunar calendar. Each Chinese New Year begins with the second new moon after the winter solstice, which usually falls sometime between mid-January and mid-February. Tomorrow, the Year of the Horse becomes the Year of the Goat (or the Year of the Sheep or Ram, depending on which translation of the Chinese word "yang" you get). "Before this modern era where the moon is scarcely visible against city lights and irrelevant to our everyday lives, moonlight often made a life-or-death difference as to whether we dared venture out at night," Slooh astronomer Bob Berman said in a statement. "Its importance was such that calendars, seasons, and holidays like Easter revolved around lunar phases," Berman added. "At Slooh, we will celebrate this vestigial legacy of the moon's importance by exploring the cultural, scientific, and mythological wonders of the new moon." Slooh is an organization that streams live images over the Internet from a network of ground-based telescopes. 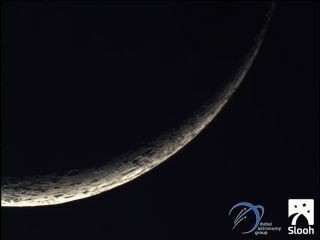 When Slooh celebrates the astronomy of the Chinese New Year, Berman and his colleagues hosting the webcast will show images of the darkened new moon taken by the Dubai Astronomy Group in the United Arab Emirates, as well as live shots from Slooh observatories at the Institute of Astrophysics in the Canary Islands and Pontifical Catholic University of Chile. Editor's Note: If you take an amazing image of the moon or any other skywatching sight that you'd like to share for a possible story or image gallery, please contact managing editor Tariq Malik at spacephotos@space.com.